Every now and again a performance achieves a quality quite at odds with its apparent intentions. 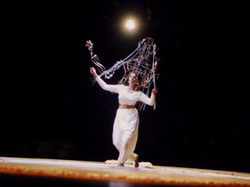 Such a one is Walking Naked, a dance and puppetry rendering by Gitanjali Kolanad of the elegant tale of the poet Mahadevi Akka, who left her husband holding her sari and walked naked into "oneness with God". Sainthood here is characterized by the transcendence of the flesh: a concept that rarely transfers successfully to the theatre. The invisible only occasionally rendered tangible, the opposite process even less common. Sadly, or perhaps not, Walking Naked never achieves such a harmony of form and content. In the dissonances there is an uneasy, but engaging connection for the spectator. Kolanad’s measured, almost pedagogical performance never consistently expresses the sensuality of her heroine, nor a physical tension in her movement. There is always something left unrendered that cannot then be disappeared. What remains is a diminished evangelism, a devotional piece that paradoxically offers the audience the sincerity of its performer. Nor are the puppets a transport to dis-incarnation. One glassy and resinous, a second of cotton and stuffing, the third a wire mesh robot-saint with hints of Metropolis and the smoky monster in Michael Mann’s The Keep. When Kolanad animates the second puppet her make-up turns clay red against the puppet’s blue and once again the effect is of dissonance and dualism rather than transcendence. All this matter in a show about walking naked. And coyness too. And here are the horns on which the production is pierced: a tale of transgression stretched to maintain propriety. But, for a spectator willing to read beyond the intentions into the accidents and resonance, there is plenty of grist for a mill that was supposed to disappear.